Retention Ponds retain a certain volume of water at all times. This means that the unsightly exposure of banks of collected sediment can be avoided. It also improves the process of removing nutrients, trace metals, coliforms and organic matter. Allowance for a considerable variation in water level during storms should be incorporated in the design, so that a significant storage volume can still be provided. The permanent water may be visually more attractive although elevated nutrient concentrations may result in algal blooms. To be successful as an amenity, a retention pond should have a catchment of at least 5 hectares and/or a reliable inflow of water in dry weather. Inlet and outlet sumps will, as for detention basins, improve performance by trapping sediment and preventing clogging of the outlet. Removal of collected sediment from the inlet sump may be needed although typically, this is not required at a frequency greater than once every seven years. 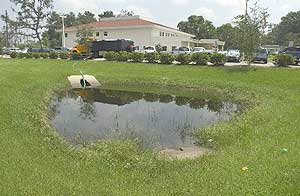 Ponds can be fed by a swale system, a filter drain network or a conventional surface water system. The last option will result in much larger peak flows reaching the pond and consequently require a bigger area. A typical retention pond will have at least 20 days retention time to permit biological degradation of pollutants. For industrial sites, a pond provides a final opportunity to catch oils and chemicals from accidental spillages around the estate. View sites in Wales with a Retention pond system.